Growing up, my family’s yearly Passover observance included the purchase and consumption of many tins of Manischewitz coconut macaroons in different flavors as well as bags of Manischewitz toasted coconut marshmallows. The funny thing about living in Israel is that those Passover staples ubiquitous in America are mostly unavailable here. 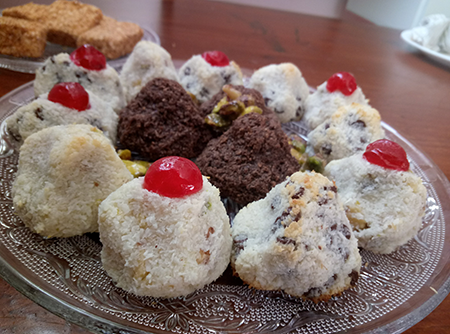 In the enterprising spirit of Israel—which extends from high-tech startups to experimenting in the kitchen—and fueled by burning nostalgia, I developed my own versions of these treats. Now, my three children are the ones re-discovering coconut macaroon cookies and marshmallows every year, but made from scratch in my kitchen. Another favorite is the mandel bread that my mom used to ship to me when I was a college student at the University of Arizona—all the way from New Hampshire. My other go-to dessert recipes are chocolate-covered matzah and apple cake, which we eat for breakfast. A definite plus to baking your own macaroons is playing with flavor combinations. I’ll be making chocolate chip, candied pistachio and walnut and double chocolate macaroons. In improving upon the dense texture of the canned cookies, I maximized the moisture content, which creates a luscious quality to the treats. To achieve this result, 1 whole egg as well as sweetened condensed milk are folded into the coconut mixture. A hint of lemon zest brings out the coconut flavor—in the same way it is used to enhance the tang in cheesecake recipes—and a relatively large amount of almond extract makes a perfect counterpoint to the sweetened coconut. For the chocolate version, rum extract joins with the almond, giving the chocolate a nice zing. As for the marshmallows, they are made with homemade toasted coconut—a step that takes minimal effort yet yields a rich, fresh, nutty taste. You need a good stand mixer to achieve the desired result—soft springy marshmallows that are preservative free. It should be noted that this recipe does use corn syrup, which some Ashkenazi Jews avoid during Passover. To a healthy and happy Passover holiday, chag sameach! Preheat oven to 350 degrees. Combine coconut with condensed milk in a large bowl. Mix in lemon zest and extract, then add the egg and stir until mixture comes together. Using your hands, form coconut balls in the same fashion you would make meatballs. Each ball should be made with approximately 1 1/2 tablespoons of the mixture. Place macaroons close together on a tray lined with parchment paper and shape the cookies into little mountains. 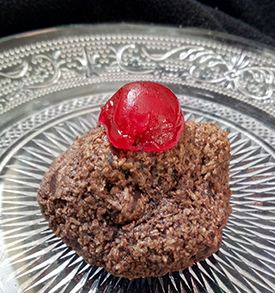 If using, top with half a candied cherry (gently push down into the macaroon) and bake at 350 for 8-10 minutes. Cookies will be done when the bottom is a deep golden color, and the outside is set. Keep in an airtight container at room temperature, or freeze to keep fresh. In a frying pan over medium heat, combine the sugar and honey. Let cook until sugar is dissolved, then add the nuts and salt. Stir to coat, and continue to cook for another 1-2 minutes until the syrup evenly coats the nuts. Spoon the mixture in an even layer onto a piece of parchment paper to cool. The nuts will be very sticky, but will harden as they cools. Let the mixture cool completely before adding to cookie mixture. 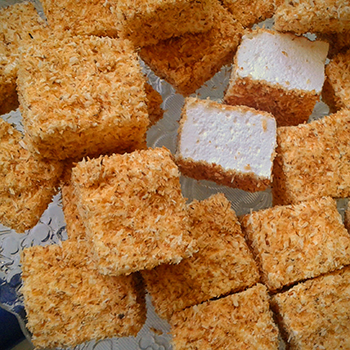 Prepare the toasted coconut: Stir coconut constantly over medium-high heat in a deep skillet, until golden brown. Set aside to cool. This step can be done in advance. Line a long brownie pan with parchment paper. Spray the paper and sprinkle with an even layer of the toasted coconut on the bottom of the pan (later you can shake off the excess and use this to coat the cut sides of the finished marshmallows). In a stand mixer bowl, combine the gelatin, 1/2 cup water and vanilla, and let sit for at least 10 minutes to gel. Attach the whisk attachment to your mixer. In the meantime, combine sugar, corn syrup, salt and 1/2 cup water in a small saucepan and bring to a boil. Make sure to remove any sugar crystals that form on the sides with a pastry brush and water. Let the mixture boil on medium high heat for 3-4 minutes, until it reaches the soft-ball stage (240 degrees). Start the mixer and whisk on low while carefully pouring the hot syrup over the gelatin. Continue beating on a low speed until the mixture thickens enough to accelerate the speed. Once the mixture allows, place the mixer on high and beat the mixture for an additional 10-15 minutes, until bright white and thick. Pour the marshmallow mixture into the prepared pan, and spread flat with an offset spatula. You can spray the spatula with cooking spray if the marshmallow mixture sticks. Sprinkle immediately with the remaining toasted coconut and let sit, uncovered, overnight. The next day, put marshmallows in the fridge for 1 hour. 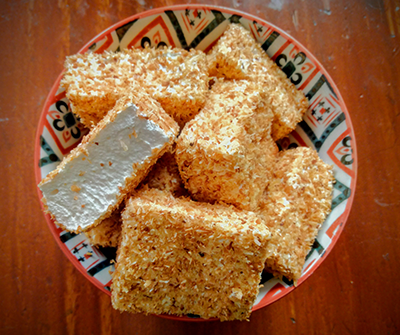 Remove marshmallows from the pan, shake off the excess coconut into the empty pan, slice into squares on a cutting board with a sharp knife, and coat the exposed sides with the extra coconut. Shake in a sieve to remove any excess coating. Keep in an airtight container. Note: To prevent ending up with a half-full bag of stale toughened marshmallows, store your marshmallows in the freezer in a zip-lock bag. Let come to room temperature (a few minutes) before serving. These recipes look great, but my family is partial to almond macaroons, both vanilla and chocolate. Do you have a gret recipe for them? 1. Process first four ingredients until smooth (Warm marzipan in microwave to make pliable first if necessary.) Dough should be sticky. 2. Wet hands with water, then squeeze off tablespoon sized pieces of the marzipan mixture. Roll in toasted almond slices and place on a baking paper lined tray. 3. Bake at 350 for 12-16 minutes. They are ready when the sides and bottom are set, but the middle still appears wet. Do not over bake! 4. Sprinkle with powdered sugar once cooled if desired. Best after 1 or 2 days, and great directly from the freezer. 1. Blend nuts and powdered sugar in food processor until finely ground. 2. Add warm syrup and extract, and process until it comes together as a slightly sticky clump. 3. If need to, add more ground almonds to make a workable dough. 4. Keep wrapped in tin foil, inside an airtight container. On the marshmallows, when did corn syrup become acceptable on Passover? Is plain Kosher gelatin even a thing? For your macaroons, you suggest Nutella. Is that Kosher for Passover? What makes these recipes Pesachdik? Nutella is available with a Pesach hechsher from aviglatt.com. Corn syrup would be ok if you eat kitniyot, which is ok if you are Sephardic or Mizrachi or now for Conservative Ashkenazi Jews. What I find more problematic is that all these recipes are milchig. Not very useful for dessert for a fleishig meal. 5. Let cool on tray so they do not fall apart. so what that it’s dairy based, we love to eat our sweets in the morning after the seder and during all the other mornings. where is the apple cake recipe? how about using almond flour and separated eggs? i can’t tolerate milk . any suggestions for substitutes? 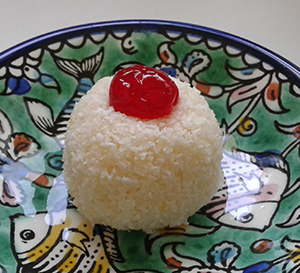 See the recipe above for a paerve coconut macaroons. Hope that helps!